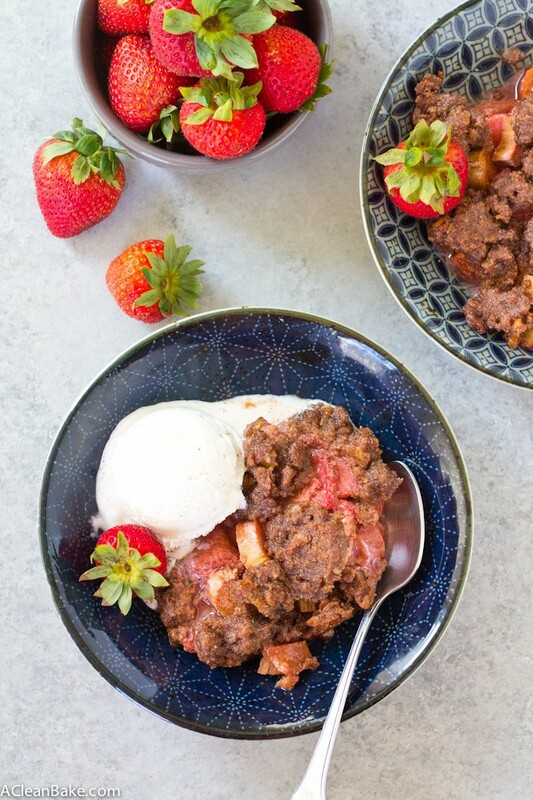 This strawberry rhubarb fruit crisp is a low carb, paleo-friendly, vegan and completely irresistible dessert for your summer nights! In case it isn’t abundantly clear at this point, I’m a little bit excited about summer produce. Does this happen to you? 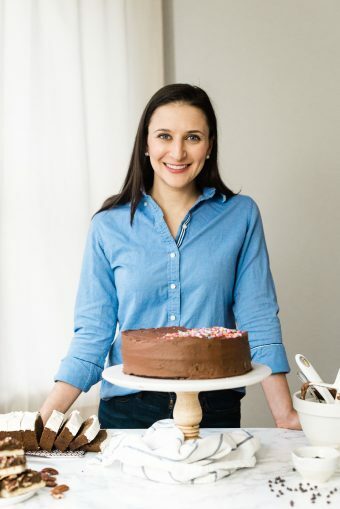 In the winter, I can’t get enough chocolate, but in the summer you can find me stuffing my face with zucchini and peaches and strawberries while shrugging off chocolate like someone is offering me a lovely plate of sidewalk chalk. Does warm weather cause some sort of temporary annual brain rot? Maybe sunshine actually induces subtle mania. The world will never know. Mostly because it will be too distracted by the spoils of August produce harvests to notice anything beyond the succulent juices dripping down their chin. Can someone please explain to me why no one has figured out how to have year-round August? I mean aside from the minor complication like blah blah physics and the entire way the universe functions or whatever, it seems like it should be a pretty high priority. Because August means warm days, the calming evening buzz of cicadas (another element that, whether you live in a cicada-friendly environment, scientists will surely find a way to work into the perma-August climate), and bushes and pints and bunches of fresh, ripe, juicy fruit just begging to be bitten into. It’s a shame to adulterate this peak-season ripeness by baking it, but let’s do it anyway. Not that we need to justify it, but just in case, feel free to point to the total inedibleness (is that the word? ineditability? Grossness? Choose your favorite.) of raw rhubarb which, fresh from the ground, resembles what I imagine Styrofoam soaked in battery acid would taste like if it mated with celery. Don’t believe me? Sneak a bite of the chopped rhubarb before it goes into the filling mixture. You WILL regret it. 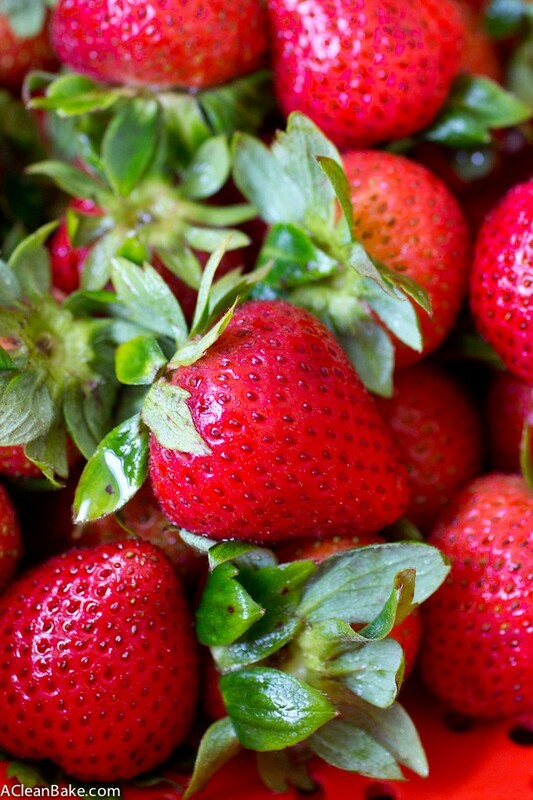 The strawberries, on the other hand? Totally different story. To be frank, it is challenging to actually get them into this crisp, so do yourself a favor and buy 2 pints, even though the recipe calls for one (1 decoy, 1 that might actually have a chance of making it into the crumble). It’s just easier that way. Although the fruit is, of course, the star of the show, the crumble topping deserves just a moment to shine, too. It’s my favorite method because it only requires a few ingredients, is completely grain free, and bakes up all sweet and buttery, like a crumble topping should be. If you want your dish to be a little more cobbler/less crisp, just make this a day ahead of time and allow it to sit (tightly covered, after cooling completely) so that the topping will become more cakey. You have options. Making this crisp, on the other hand, is not optional. (Sorry to be the bearer of delicious news.) I mean, it’s not August without easy fruit crisps and how on earth will we ever embrace perma-August if we don’t start now? Preheat the oven to 350. Lightly grease or spray a pie plate and set aside. 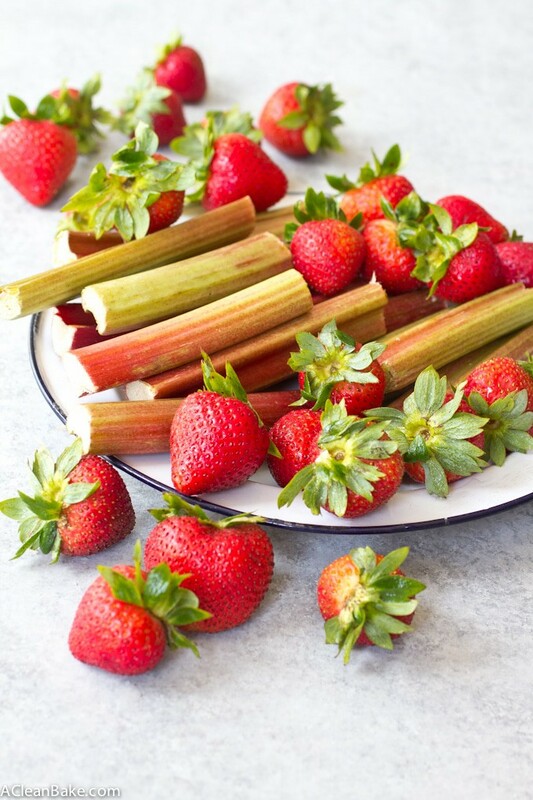 In a large mixing bowl, fold together the rhubarb and strawberries until combined. Add the lemon juice and fold to distribute. Stir in the tapioca starch, sweetener, cinnamon and cardamom. Taste and adjust spices if desired. Pour the filling into the prepared pie dish and set aside. Wipe or scrape the excess filling ingredients out of the mixing bowl and make the crumble topping. Whisk together the almond flour, coconut sugar, cinnamon, coconut flour, and salt. Add the pecans and stir briefly to incorporate. Pour the maple syrup into the coconut oil and stir to combine, then pour the mixture into the dry (flours/sugar) mixture. Stir until it has the consistency of a slightly wet cookie dough. Use your fingers to crumble the topping dough evenly over the top of the fruit filling in the pie pan. 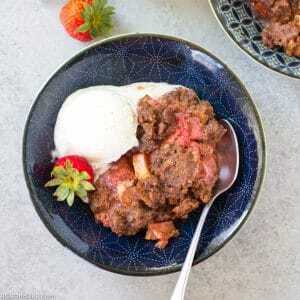 Bake for 45-60 minutes until the filling is bubbling around the edges and the rhubarb is tender. Allow to cool before serving, topped with ice cream if you want! Store leftovers in an airtight container in the fridge for up to a week. 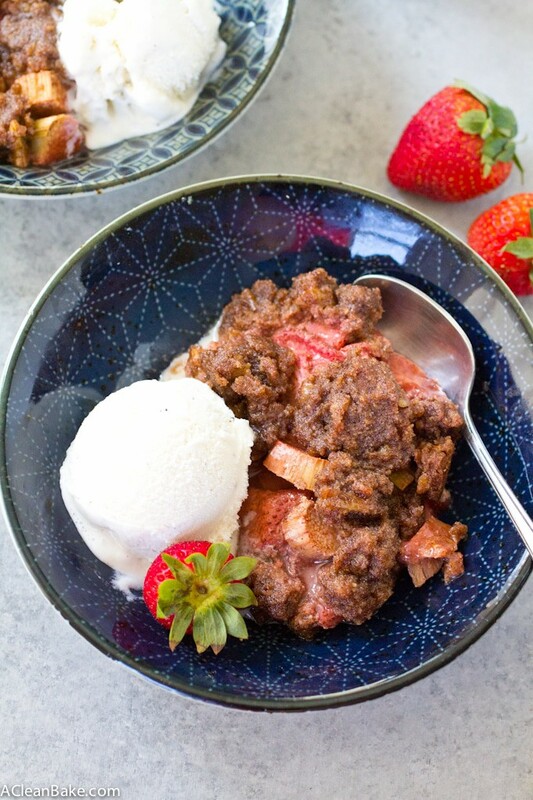 Strawberry rhubarb is my ultimate favorite!! My mom makes a strawberry rhubarb pie once a year and it is the most wonderful treat. I cannot wait to try this paleo version! Mine too! Your mom’s pie sounds amazing!